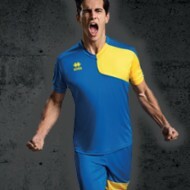 At TotalSports Teamwear you can rest assured that you are dealing with teamwear experts! We have years of experience when kitting out football clubs and can print sponsors logo's, club logo's and names/numbers on all shirts, shorts and training tops. Our reliability, speed and dedication to making sure you're provided with the best kit for you is exactly why TotalSports Teamwear should be your first choice. We cater to all budgets, whether you're looking for a single kit for one player, a set for your 5-a-side team or a full 11-a-side team with substitutes, reserves, u18s and youth teams - we can do it all. If you've arrived here looking specifically for cheap football team kits, we're sure you'll find our prices to be extremely competitive and with a level of service & quality that other companies simply can't match. If you have any questions then do not hesitate to contact us using the contact form and one of our team will get back to you. 70%Polyester 15%Cotton 10%Polyamide 5%Elastane	..